Yes, the alt-right neo-Nazis are coming to San Francisco. 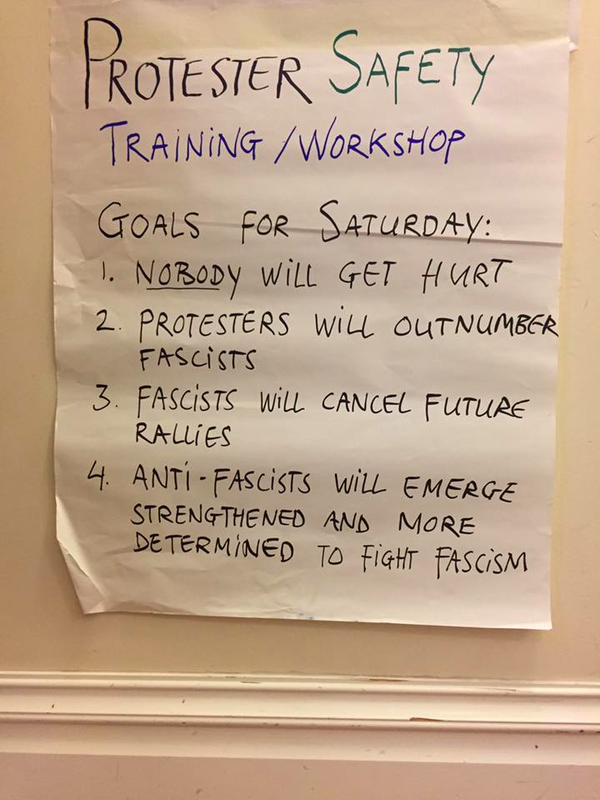 They got a federal permit to gather at Crissy Field on Saturday, August 26th, and they are also expected to be in Berkeley on Sunday, August 27th. People are mobilizing in different circles. Here are some of the protests that I was able to locate, so you can go to at least one of them. I’ve highlighted the one I will be attending. My aspirational hope is to build coalition and solidarity amongst various organizing groups so we can gather a massive crowd in one centralized location (check out Boston’s inspiring counter-protest), hopefully in Civic Center. Obviously, this list is not exhaustive. If you want me to add to the list, just leave a comment. If I made a mistake, leave a comment. Want to know where I think you should go? Check out my latest blog post for recommendations and to find out where I’ll be. But let's be clear -- showing up somewhere is better than not showing up at all. We need all of us fighting against one enemy on Saturday. We can debate the nuances of social justice organizing while doing that. Let’s always remember who the real enemy is and that we must rise together. So you’ll find me in Civic Center, with my queer fam, drowning out the white supremacist nonsense with my overflowing love and joy for our community. Hit the streets. See you there. By now, you must have heard about the "anti-diversity" manifesto by (now a former) a Google employee that got published. You may also know that he was fired just a few days later for "perpetuating gender stereotypes." While I applaud Google for prioritizing the need of women at the company and taking swift action, I'm also afraid this is yet another milestone for further polarizing the tech community (and probably the broader, divided nation) along the party line. The "free-speech" protecting right (or self-claimed "rationalists") vs. the scattered left. What's truly sad (but not shocking) about this whole situation is that this person, James Damore, a Havard educated, seemingly well-intentioned fella, had steadfast beliefs based on his complete misunderstanding of how "sexism" or "discrimination" actually work. And that's the problem with the way we talk about diversity and inclusion in the business world. People are learning about unconscious bias WITHOUT the foundational knowledge of the cycle of socialization. People are learning about microaggressions WITHOUT the context of power dynamics. People are learning about "diversity programs" WITHOUT true understanding of concepts such as privilege or allyship. People are learning about diversity-recruiting WITHOUT the awareness of structural and institutional injustices that impact the pipeline. People are learning about inclusion WITHOUT the exposure to exclusion. We CANNOT talk about "D&I" without bringing in these decades-old, fundamental social justice concepts!!! As a lifelong social justice activist who worked in grassroots activism prior to working in the for-profit sector, I feel the “D&I” conversations sometimes feel disparate / distilled down from what’s actually in play in our society. Whenever I hear people throw around terms like "reverse -ism" or "reverse discrimination," I realize we need to take many steps back and start the conversation over and talk about core, fundamental sociology concepts such as power, privilege, and systemic oppression. But how many of us actually do? While I've seen an uptake in people wanting to be more active and socially conscious, I've also seen an equal, if not more, increase in people engaging in slacktivism in the form of mindless social media sharing, dragging people for public shaming purposes (or for their own political capital gain, because #clappingback gets you noticed) without any intention to call IN, or simply blaming without understanding these important concepts themselves. Now I'm not saying the onus should be on the marginalized folks to do this labor. What I am saying, though, is that companies and people in positions of power, including those whose job it is to educate people on "diversity and inclusion" issues (many of them often white folks, ahem), have the obligation to make their programs and workshops actually effective in delivering real learning outcomes that bring positive change versus creating more harm or creating a culture of shame (vs. accountability). And if your company's in-house team is not equipped to do this, hire experienced people -- but do your homework in vetting the right people (like my team via Awaken, but really, there are many others), and try to hire folks from marginalized communities (black, brown, queer, women, trans) and those whose teachings are grounded in social justice. I always prefer non-corporate bred trainers when it comes to D&I stuff -- people who have done work at the grassroots level, who know how to hold space for various folks, navigate tension effectively, and educate people not at the expense of marginalized people in the room. Those are my types of peeps. James Damore's world view did not include some of the most basic, fundamental understanding of how our society operates. He had so much conviction in his own "logic, evidence-based" perspective, and no one seemed to have had made an impact on uncovering his blindspots. I'm truly saddened by this reality, but again, not at all surprised. I can't help but feel defeated in knowing this incident has caused even further divide among people who may actually care and want to do the right thing, but may not know how to, or have a misguided perspective on what is the right thing to do. Truly, I feel sad for all of us, because the truth is, we are all losing. We have so much work to do. Let's begin to engage in tough dialogues to bridge the widening gaps among us, and meet each other with compassion and criticality. I truly believe this is the only way for us to start healing collectively.